Your manager may have entered one or more emails for you. This will open the Options & Notifications window where you can check off when you want to be notified at this particular address. Checking the "Use as my "Reply-To" address allows a message you send to a worker or manager to be forwarded to their email, and for the recipient to be able to reply back to you by email. Note: If you do not have a reply-to address set up, managers and workers will have to sign in and use the Messaging section to respond to your message. If you enter and select an email address, your notifications will begin immediately. If you choose a text message address, the messages sent will be shorter (15 characters max). 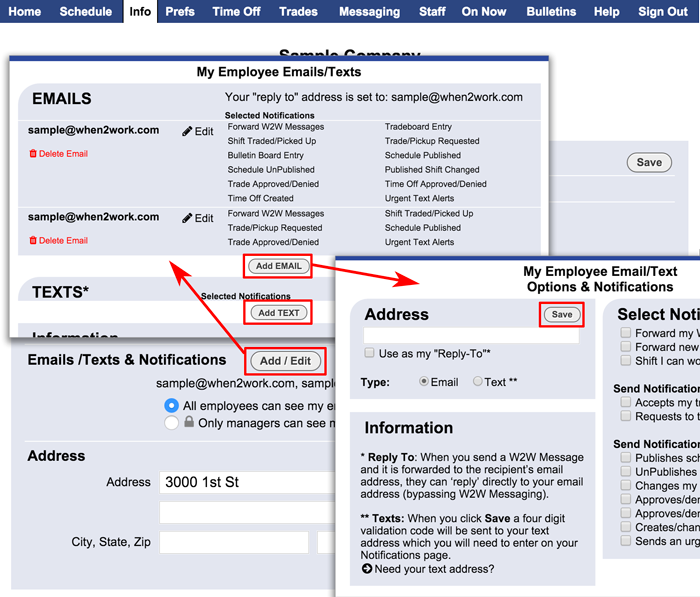 You will be prompted to go to your cell phone and get the 4 digit validation code sent by WhenToWork, and then enter it into your notifications page and click Save. Once you have entered the validation code, your notifications will begin.